The last activity of the Vancouver Cherry Blossom Festival is Bike the Blossoms, a bicycle ride under cherry blossoms this Saturday. 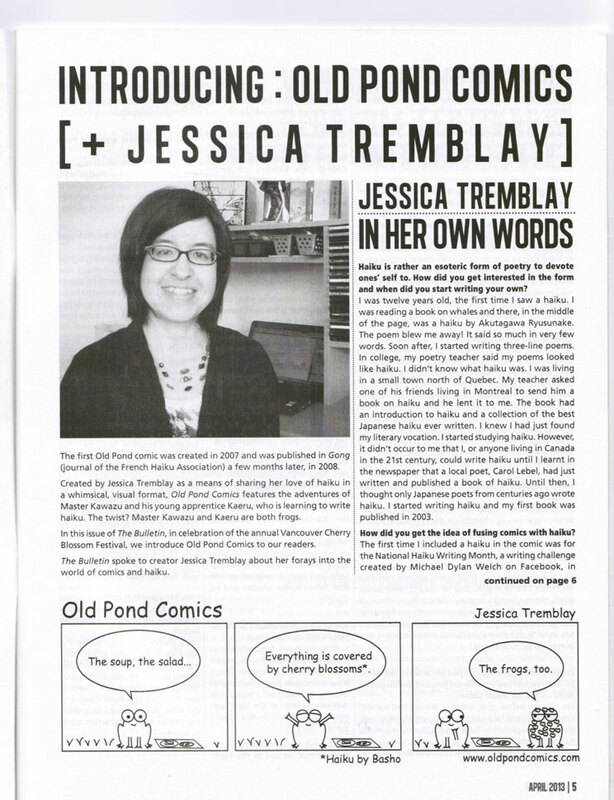 Old Pond Comics was published in the April 2013 issue of The Bulletin: a journal of Japanese Canadian Community, history + culture. Starting April 2013, Old Pond Comics will be published monthly in The Bulletin: a journal of Japanese Canadian Community, History and culture distributed in Japanese cultural centres across Canada (in print and also on the web). In the interview, I talk about NaHaiWriMo created by Michael Dylan Welch, mention the Vancouver Haiku Group lead by Angela J. Naccarato, Lighting the Global Lantern written by Terry Ann Carter and the Vancouver Cherry Blossom Festival haiku Invitational. I will post the PDF soon. (The Bulletin, April 2013 issue).